How do I go about getting my systems installed by Sun Energy Systems? How much energy will my solar power installation generate? 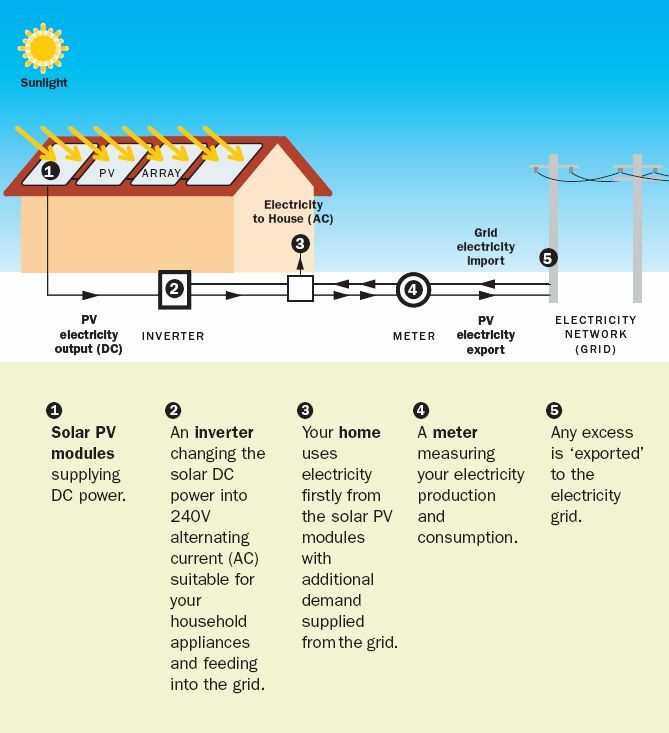 How does a grid connect solar power PV system work? What do the terms ‘grid connect’ and ‘stand alone’ mean? Does the solar system require maintenance? STEP 1 – You make the decision that you want to install a solar power system. STEP 2 – We design the system, we arrange all of the paperwork and the Small Scale Technology Credits (STC's) and then we install the system for you. STEP 3 – You relax and enjoy free power from the sun for many years to come. The amount of solar power your system will generate depends on a number of factors; the size of the system you have installed, the effectiveness of your installation and the weather in your locality. Typically, the main variable is the average number of sun hours that your installation receives. As an average a 1kw systems will produce around 5 kw hours of power a day. After you have your solar system installed the savings just keep mounting. And an annual energy bill of $720 would drop to around $450 with a 1kw solar grid connect system in normal circumstances. In some cases with the Queensland Solar Bonus Tariff our customers will not even pay an electricity bill. Put simply, solar power installations use solar panels, some wiring and electronics to convert light energy from the sun into electrical energy. During the sunlight hours your solar power system will be at its optimum production level; if your solar power system produces more electricity than your home is currently using, your electricity retailer will allow this excess power to be fed into the main grid network, paying you up to 3 times your normal rate for electricity under the Queensland Solar Bonus Scheme. During the night time when your solar system is not generating power you will be using mains power as you normally would. See how solar power works. The term ‘grid connect’ refers to solar power systems that are connected to the main power grid, (which is what all homes and businesses are connected to) and these type of systems feed excess electricity generated by your solar power system back into the grid. Grid connect systems are the most common and cheapest systems install. Stand alone systems are generally only used in remote areas where there is no mains power and the stand alone systems store power into battery banks for use anytime. We are qualified and experienced in installing both grid connect and stand alone solar power systems. Once the system has been installed there is little ongoing maintenance that is required. The only thing that may need attention, is to clean the solar panels. Although generally they self clean because they are installed at the same angle as the roof. Sun Energy Systems can arrange for yearly inspections of your solar power system and clean and inspect the installation. Solar Partners - Website by D.C.